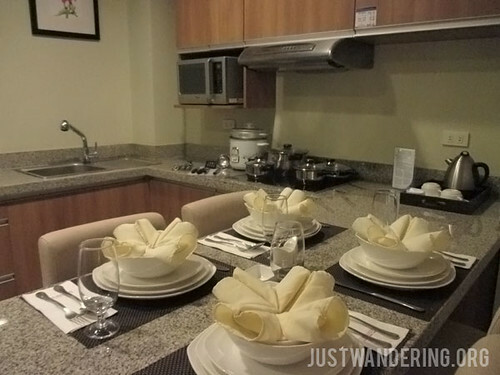 The Azalea Residences Baguio is an all-suite property located just off Leonard Wood Road. The rooms have the usual hotel amenities, but with the addition of a working kitchen with actual stove and cookware. You’re probably thinking, “why cook when there are so many great restaurants in Baguio?” I agree with that, but after discovering the Hanger Market (where the locals buy fresh produce), and seeing the great variety (and price!) of vegetables available, I was sorely tempted to cook them IMMEDIATELY to get the optimum flavor out of them. We stayed in a 2-bedroom suite, which can accommodate up to 6 adults. The masters bedroom has its own toilet and bath, the other room has a single bed, and the couch in the living room can is actually a pull out bed. There’s another toilet and bath in the common area of the suite. There’s no shortage of TV in our room either: there’s one in each room, including the living room. Our suite only has an extended counter with bar stools for meals, but the 3-bedroom suite has both the extended counter and a separate dining table. Both have crockery, cutlery, coffee and tea making facilities, induction stove, refrigerator, microwave oven, kitchen sink, and ample pantry space for all your junk food. Cookware are available upon request. 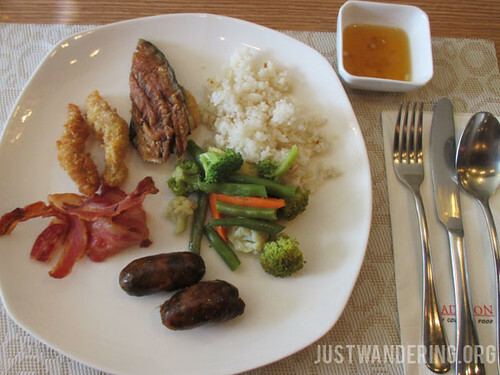 We had our breakfast (and some lunch and dinner) at the Tradisyon Restaurant on the ground floor. There’s the ubiquitous buffet spread, but you can also order ala carte. They sometimes have themes to their buffet, like the Italian spread during our Saturday night dinner. If you’re feeling the chill, you can’t go wrong with their shabu shabu or hotpot. To help you warm up even further, you can have drinks at 8 Degrees, which serves both coffee and alcoholic beverages. The staff were all warm and friendly, even when we checked in past 4 am, and were still smiling when we stumbled into the hotel after a night out in town at 2 am. Would I stay at Azalea if it’s for a personal trip? I think I will. I liked the rooms (I’m aiming for a room with a balcony next time), the fact that there were two bathrooms in our room (though I’m iffy about the tiles, but it’s a personal quirk — the bathrooms were clean), and to be honest, that glorious fruit basket that welcomed us when we arrived won me over. Another thing that delighted me about Azalea was their toiletry kits. The packaging was just beautiful, it was eco-friendly (or so it says in the label), and personalized — the body lotion is made for dry and cold weather. There’s also a grooming kit (razor, comb, etc. ), and it may seem like a small thing, but the toothbrush came with a COVER. A small gesture, but it meant a lot (to me anyway). In the closet, there were also sewing kits, and a shoe mitt. It’s the first time I’ve encountered a shoe mitt. I make weird attachments to the most absurd things, I know. 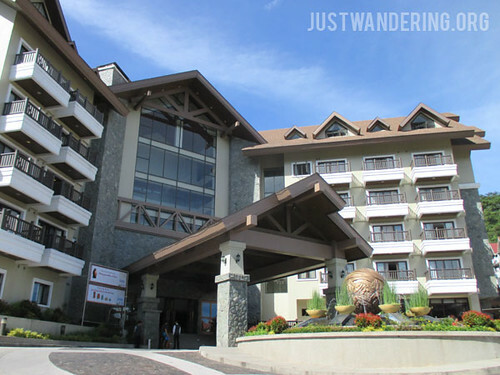 Azalea Residences offer great packages that aims to give you the ultimate weekend getaway in Baguio. The 3-day, 2-night package includes the accommodation, daily buffet breakfast, lunch or dinner at Tradisyon Restaurant, half-day Baguio countryside tour, Treetop Adventure (go for the Superman! ), and the clincher (for me anyway): 3-hour use of their chauffeured air-conditioned van around Baguio city. 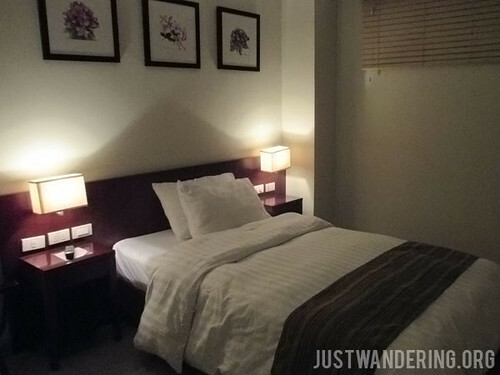 View more photos of Azalea Residences at the Just Wandering Facebook Page. 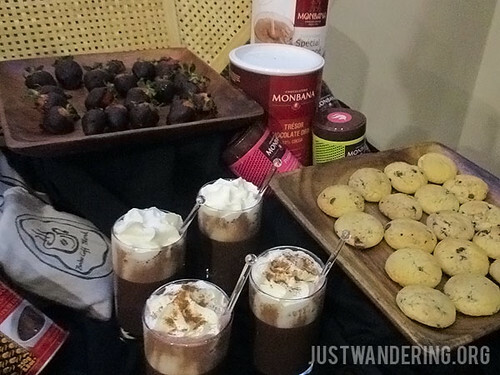 What I badly miss right now is a classic Filipino breakfast. I have to make sure that when I come for Christmas, I’m able to check in somewhere that offers a Filipino breakfast buffet. Nice post ! Food looks incredibly good !! The place looks good to me. As long as it’s affordable, I would consider using that on my next stay in Baguio.